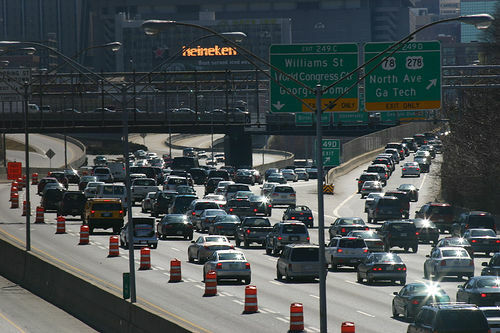 Traffic on Atlanta's roads has doubled along with the area's population over the past 20 years. Photo via jcburns. There’s still hope for sustainable transit around Peachtree Street. On June 2, Georgia Governor Sonny Perdue signed a comprehensive transport bill (HB 277) for the state, which we’re hoping will help Georgian cities – Atlanta, in particular – invest more in urban sustainable transport. As The Economist highlighted last week, traffic in Atlanta is “purgatorial” on its best days and hellish all the rest. Between 1987 and 2007, metro Atlanta’s population nearly doubled, from 2.6 million to 5 million, and in turn, the number of drivers during peak hours doubled, as well. By 2007, the 2.4 million drivers on Atlanta’s roads each day wasted a total of 135 million hours – and 96 million extra gallons of gasoline – stuck in traffic jams. Georgia’s transit infrastructure hasn’t kept up. Between 2000 and 2006, Georgia was the third fastest-growing state, but it still ranks 49th in terms of infrastructure spending per capita. This is partly because of a long-standing divide in the state’s legislature between representatives of Atlanta and those from rural areas, whose constituents would not be happy about new taxes to improve transit in the big city. Now, the new bill creates twelve regional transportation districts across the state; Atlanta’s transportation district includes ten counties. The twelve new districts will hold a referendum in July 2012 (during presidential primaries) to decide whether to levy a 1-cent increase in sales tax within their respective regions for transportation investments. Atlanta's rapid transit system, MARTA, has struggled to remain afloat with no state funding and a 50/50 restriction on its operating/capital expenditures. Photo via tracktwentynine. In the meantime, the more controversial part of the bill (part of the reason it spent three years in the legislature) contains some promising news for Atlanta’s anemic urban bus and rail system, MARTA, which is by far the largest of its kind in the United States to not receive any funding from the state. Since its inception in 1971, MARTA has only received funding through a 1 percent sales tax levied in Fulton and DeKalb counties – where it runs – and ridership revenues. To make matters worse, a state mandate restricted MARTA to spend only 50 percent of the sales tax revenue on operating costs, with the rest going to capital improvements. No other transit agency in the state has this restriction. And according to the Brookings Institution, operating expenses are generally about twice as much as capital costs for the nation’s largest transit agencies (MARTA is the nation’s ninth largest). The new bill lifts spending restrictions for the next three years, and there’s potential for more funding after 2012. 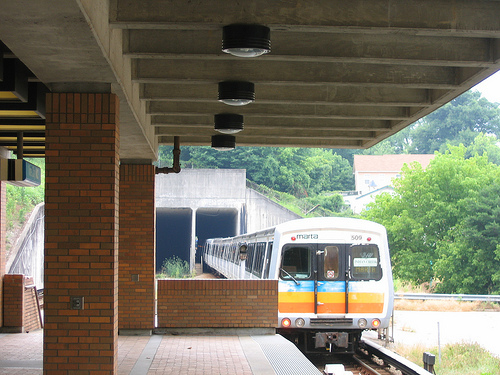 MARTA has already “flexed” $12 million from capital to operating reserves. This will not be enough to prevent impending service cuts and fare hikes, but will at least help keep MARTA running for the next few years, before the benefits of a new 1-cent sales tax can be felt. Ray Christman, executive director of Atlanta’s Livable Communities Coalition, recently wrote about how Atlantans can make sure to leverage this bill for improvements in public transit and “complete streets” projects. Christman highlighted the importance of developing a balanced set of criteria for selecting transit projects to receive funding: the projects selected based on these criteria will be listed on the ballot when voters in the 10-county Atlanta region decide whether they want to pass the new tax. So, according to Christman, the Georgia Department of Transportation’s planning director and the board of the Atlanta Regional Commission (ARC) need to include transit-oriented development concerns in their criteria for new projects, along with traditional concerns, such as improving road safety and congestion. A balanced list – and a major campaign – will be necessary to convince voters across Atlanta’s region that they should pass this tax in July 2012. Christman also emphasizes that another positive note from HB 277 is its creation of a legislative study commission tasked with analyzing new regional transit governance structures. The commission’s work could complement that of ARC’s Transit Planning Committee and optimistically lead to a plan to expand the current two-county MARTA system to connect the ten counties that the Atlanta district comprises. Atlanta Mayor Kasim Reed was instrumental in helping get the bill passed, risking trouble with fellow Democrats who said the bill was not enough. And the bill isn’t enough, yet, but it’s a promising first step toward relieving the region’s transit problems. What do you think about this new policy?